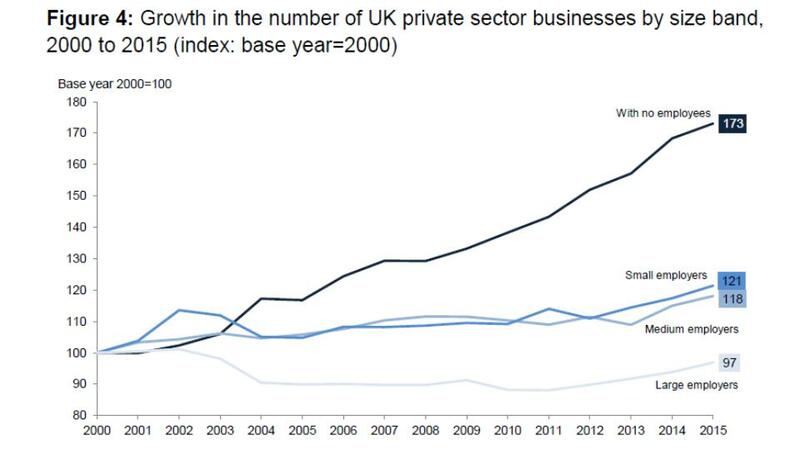 The number of new companies being formed in the UK has been steadily rising for the last few years. This is often seen as an indicator of entrepreneurial spirit (which it is) but it is also a result of more complex factors to do with tax, investments and employments rights. The government have announced a number of changes to the tax system this year which we predict will alter the types of limited companies being formed in 2016. One the biggest drivers of new company formations in recent years has been the rise in self employment and contract working. 76% of UK businesses are now owned and operated by a single person. Many of these single person businesses are people working as nurses, drivers or labourers on a contract basis and forming a limited company tends to be the preferred vehicle for them to operate through. As a company formation agent we regularly speak to nurses, drivers and care workers who are told by employment agencies to form a limited company in order to get work. Limited companies are now the fastest growing business type in the UK with 8% increase in numbers over the last year compared to a 2% increase for sole traders. Single employee businesses now account for 44% of all UK limited companies in the UK. While we still expect to see lots of agency workers and freelancers forming limited companies next year we think the rate will slow down. Changes to the dividend and tax system which are coming in from April will remove some of the tax advantage of operating your own limited company. These changes will reduce the amount people can take in dividends and push people towards using a PAYE scheme as they would in a regular salaried job. Hand in hand with the tax changes is a new public focus on the use of agency workers by large public and private sector organisations. The NHS bill for agency workers (many of whom use a limited company) rose from £1.8bn to £3.3bn over the last three years. This has lead to the government to introduce a cap for the amount NHS trusts can pay agency workers per hour. As well as decreasing the financial incentive for agency workers this move signals the growing public and press awareness of issues around the use of agency staff. These issues were also reflected in the collapse of City Link at the start of 2015 where large numbers of contractor drivers operating their own limited companies were left high and dry. The Labour Party have started to focus on these issues in recent months with Deputy Leader Tom Watson calling self employed people the ‘future frontiers’ of the British economy. We think that the increased political focus on the use of contract and agency workers will also contribute to more large organisations being wary of using them. As we have seen with the recent news stories about Sports Direct negative publicity around working practice can have a real effect on stock market values. However we also know that most of the contract and agency workers who approach us are forming a limited company because they have been told by an agency that it is what they need to do to get work. As long as the agencies keep doing this it is likely that agency and contract workers will continue to be a major driver for company formations. Alongside the agency and contract workers discussed above there has been a more general move towards freelancing and self employment in recent years. The ONS have suggested that one of the causes of this trend has been the poor shape of the job market after the 2008 financial crisis. The basic logic being that more people became self employed due to a lack of other opportunities. While for many people this will have been a positive move on average self employed people earn less than people employed in regular jobs (as much as 40% less). This pay differential, combined with the trend to self employment, has been suggested by some economists and commentators as a factor in the UK economy’s lacklustre productivity figures over recent years. With a higher proportion of the workforce being self employed leading to lower overall earnings and spending. As the job market has improved in the last year wages for people in regular jobs have also started to pick up and skills shortages have increased. This means that it is likely to become more attractive for some freelancers and self employed people to go back to full-time employment where they can earn more money and have more regular hours. This is likely to mean less people working as self employed and less people making the move from full-time employment to self employment. As a result we would expect to see less limited companies being formed in the UK. However, while increasing demand and wages in the job market is likely to drive people away from self employment it also opens up opportunities. Many businesses are now reporting problems with hiring skilled workers and it is likely that the workers they can hire are going to be more expensive. As a result there are potentially going to be more opportunities for skilled freelancers and companies offering outsourced services to win work. So, as tax changes kick in and the job market picks up working self employed through a limited company is going to be a less attractive option for many workers. As a result we expect to see the number of limited companies being formed in the UK leveling off during 2016. We are not expecting a dramatic decrease in company formation numbers due to the continued trend towards agency working and the increased opportunities for freelancers caused by skills shortages.